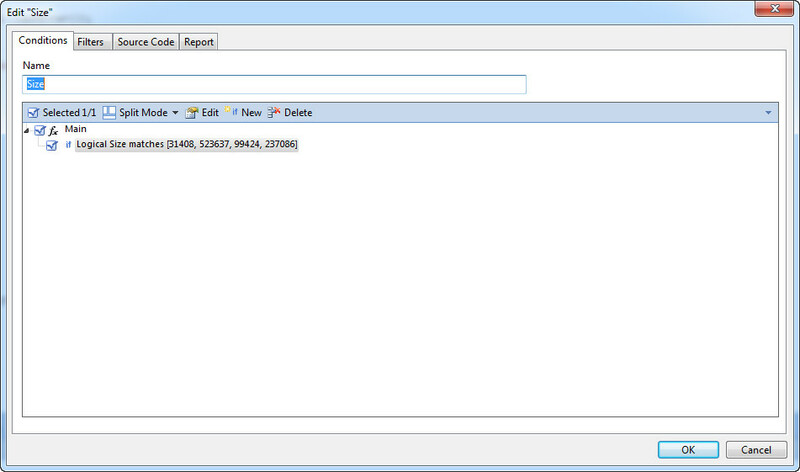 This is an updated version of an EnScript I wrote in 2009 to export files in a case based on file extensions. The original description & EnScript is here. 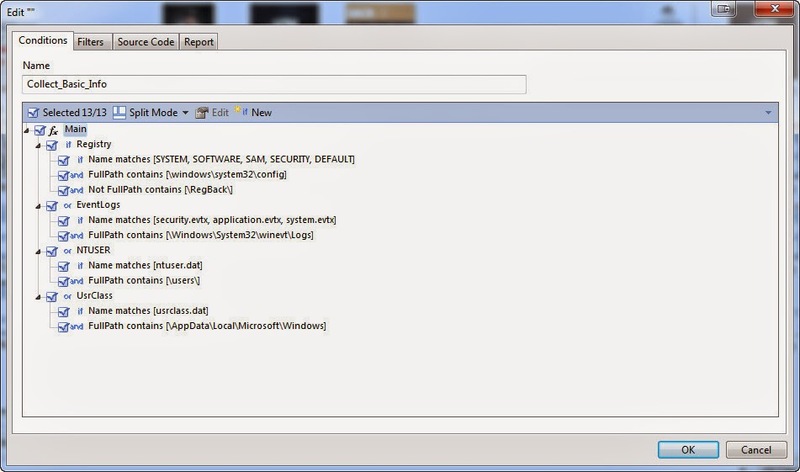 This version was rewritten for EnCase v7 with exactly the same functionality. 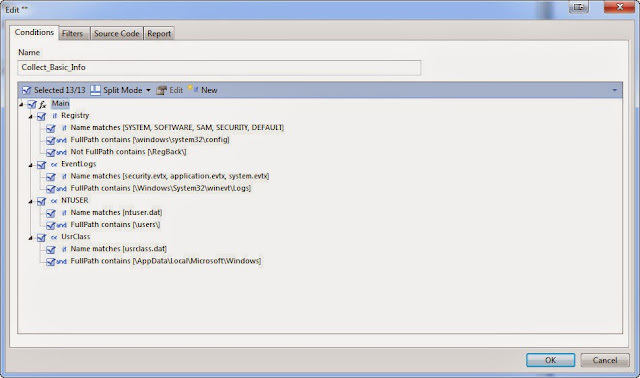 EnCase EnScript to find files on remote systems by MD5 hash - GO FETCH! 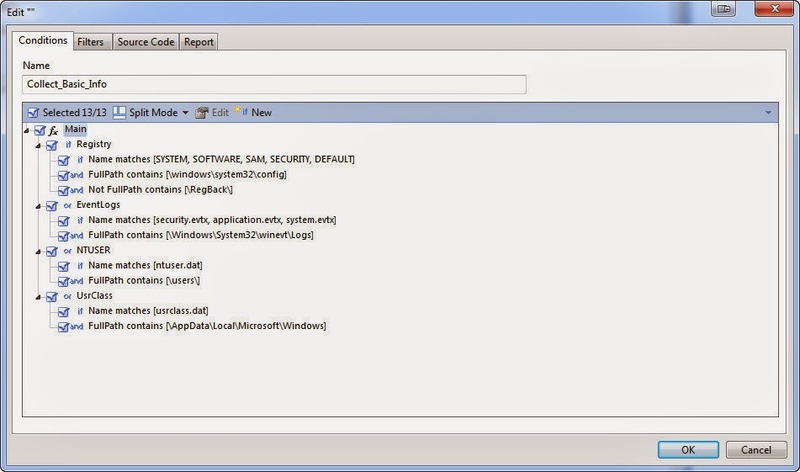 I have had a few recent requests for an EnCase Enterprise EnScript to help find files on remote systems. The following EnScript accepts a plain text file (ASCII or Unicode) that contains MD5 hash values, one per line. The EnScript also contains a condition feature that allows the user to refine what files on the remote system they want to hash and compare to the list. Choose a text file, define a condition, go fetch. The logical choice is to define a condition that contains specific file sizes (logical size). This will cause the EnScript to only hash the remote files that match the file sizes (or path or other criteria) you specify, dramatically speeding up the searching process. The next screen allows you to define a condition. I strongly recommend using the logical size to reduce the number of remote files that need to be hashed and then compared with your list. If you do not have logical sizes of the files you want to search for, you can use other criteria such as name, path or other metadata, if feasible. 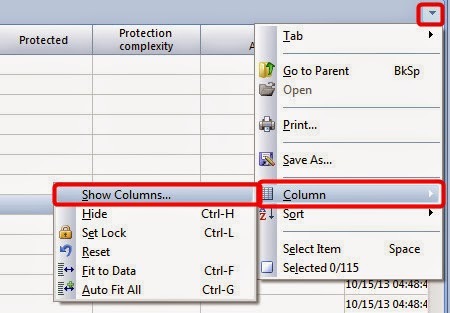 Its important to remember that this is a normal condition used by EnCase, therefore if you do not specify any criteria (and leave it blank), no remote files will match that criteria and no files will ever match. So, if you do not have any criteria to help refine and reduce the remote files that need to be hashed and compared, you need to at least define a filter that includes everything, such as logical size >0. In October 2013, I wrote an EnScript that checked files that are tagged with the "VirusTotal" tag to VirusTotal. That original EnScript simply calculated the hash value of the tagged files and then sent it to VirusTotal for evaluation using their API. The original EnScript used an external EXE (VTBookmark.exe) that I wrote in C# to do the actual communication to the VirusTotal website. I have updated this EnScript to include the name of the detected malware that each AV product associates with the hash value. I have also rewritten it to no longer require the external "VTBookmark.exe" application. All the processing and communications are handled natively by EnScript now. A score of '0' signifies a hash value that is known to VirusTotal, but is not identified by any of the AV products as a risk. A score of '-1' signifies a hash value that is unknown to VirusTotal. This means the file contents have never been sent and/or analyzed by the AV products. When run, you can choose to tag specific files (recommended when using a public API key) or not have any 'VirusTotal' tag and the EnScript will conduct a file signature analysis and send the hash values of all identified executable files to Virus Total (recommended only if you have a private API key). This EnScript can be used with a private VirusTotal key with no time limit restrictions and can process several thousand hash values per hour. Below is a link to the slides from my presentation at CEIC 2015, as well as some example EnScripts. A reader recently asked if I could create an EnScript that would create a LEF based on a condition. Unfortunately, the reader wanted to use it with the free EnCase Imager program, which does not support creating LEFs or using the ConditionClass. 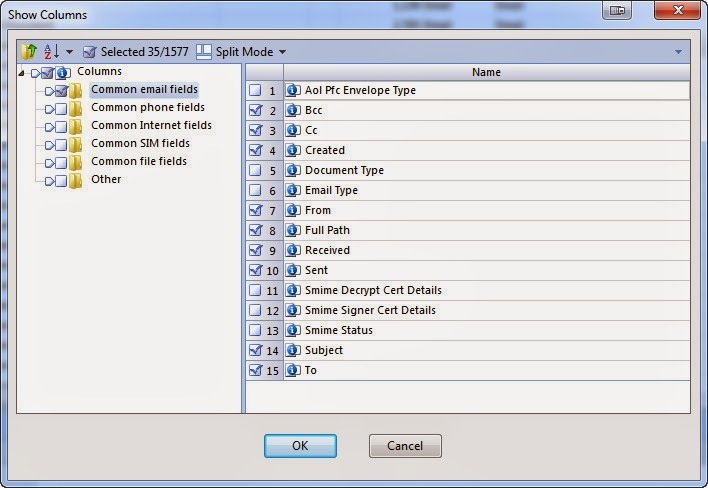 However, I did create an EnScript that can be used with EnCase Forensic/Enterprise, which will create a LEF based on condition criteria that you can define. This EnScript requires Microsoft Excel be installed on the same computer where it is run from. When run, the EnScript will parse all .PST file found in the case.